Kidspert: Why Have Kids If You Can't Mess With Them? April Fools Day on Easter Sunday + kids old enough to understand the concept of April Fools = parents who took full advantage. We've never really done April Fools pranks before. Quite honestly, when it falls on a weekday we're usually so busy that it's forgotten until it's passed. Plus, our minis haven't been old enough to fully understand the concept or fun that is April Fools Day. Until this year at least. The boys fully understand pranks and jokes. Better yet, they appreciated it. We went easy on them this year. We put cling wrap in front of their door, put fake poop (bought at Walmart) on their pillows, and made them chocolate covered cotton balls. 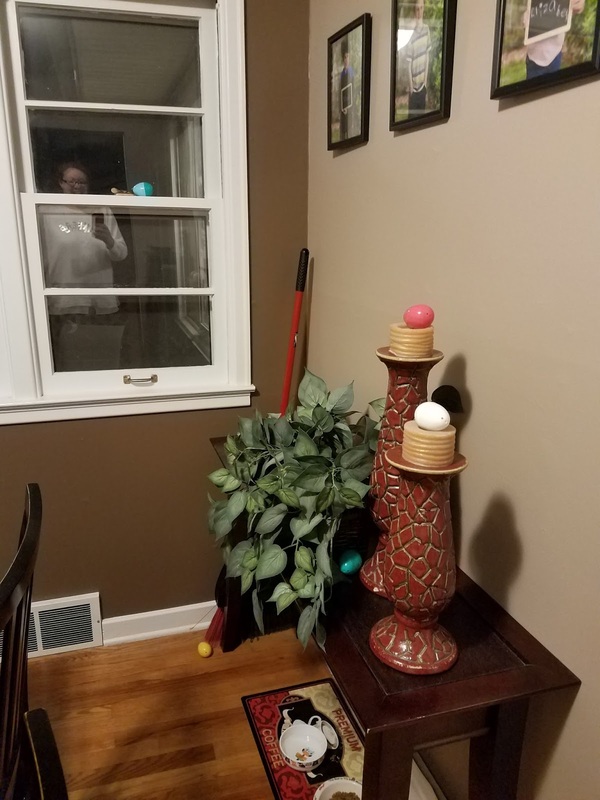 We also told them there were eggs hidden all over the house, when in reality they were just hidden in the dining room. This was designed to let us drink our morning coffee in peace. 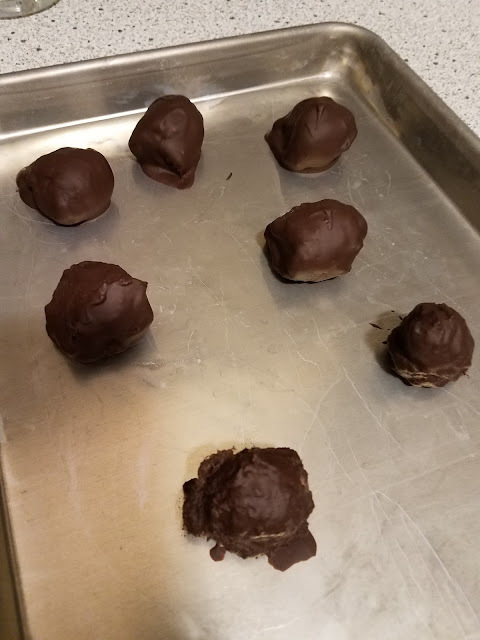 You gotta admit, those chocolate covered cotton balls look kinda tasty (on the outside that is). The cling wrap was hilarious. I happened to fall asleep on the couch (I've been so exhausted that this has happened the past several nights) and was startled awake at 5:00 a.m sharp when I heard a mini open their bedroom door. I waited, listening for whoever it was to walk straight into the cling wrap. I didn't hear anything, just several minutes of silence before the door shut, then I heard in a panicked, whispered voice, "Harrison! Harrison! Wake up! We can't get out! We're trapped!" I heard the door open again, followed by a few minutes of silence, then the door closed again, and whispering ensued from behind the door. I laid chuckling to myself for a few minutes before I went to open their door. "What's up guys?" I said as I opened their door. The middle mini was standing there, with a huge smile on his face. "We can't get out of our room. We're trapped in here. Did the Easter Bunny do that to us??!!?" I laughed, as I noticed the oldest sitting on his bed with an extremely worried look on his face. "No, that was dad and me. Look, the bottom is open so you can crawl underneath." It was at that point that my oldest worrier looked a bit calmer. 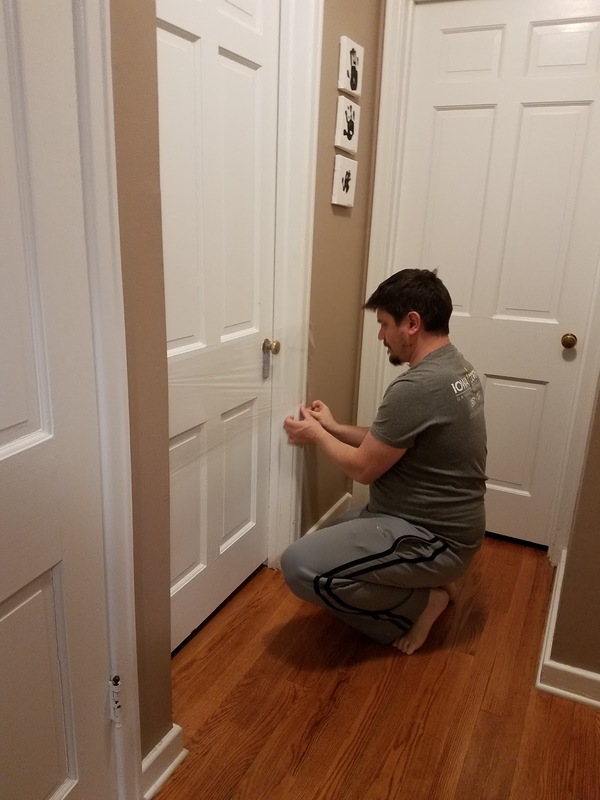 He didn't laugh about it until he pulled the cling wrap away from his doorway. The middle minis was also the one who dove right into the chocolate covered cotton balls. At least he seems to have gotten our sense of humor and laughed about our pranks. Of course, the boys got us back pretty good. Since I was woken up so early, I required a long nap after brunch. Hubs was downstairs with the kids, but doing something while they "played." 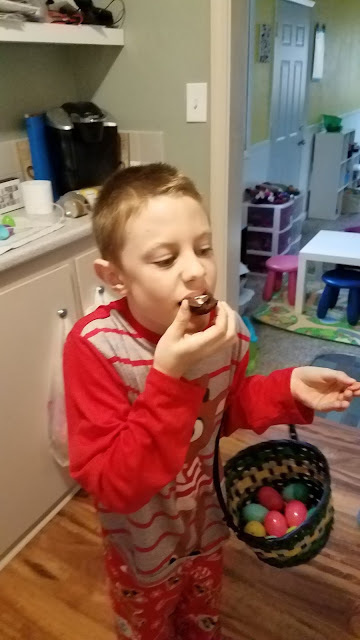 I was alerted that they were up to something when they asked him to open the jar of chocolate fudge that was in the refrigerator. They happily told us they were playing a prank on us. It was reported to me that numerous coffee cups and bowls were being taken out of the cupboard. I assumed they were making us "coffee" and would bring it to us shortly. This explained the sun butter, chocolate fudge, and yellow food coloring sitting on my counter. They ever mixed the sun butter and chocolate fudge into the perfect consistency. Yes, I was grossed out, but I was also kinda proud. I mean, look at that detail AND they pulled off the prank without giving it away. I'm spending this next year thinking of what we can do for next April Fools Day.